Weather Data from the Bridge: 15 knot winds gusting to 20 knots, wind waves 3-5’ and a northwest swell 3-4’ four seconds apart. On the even-numbered “lines” we don’t just survey birds and mammals. We do a lot of sampling of the water and plankton. 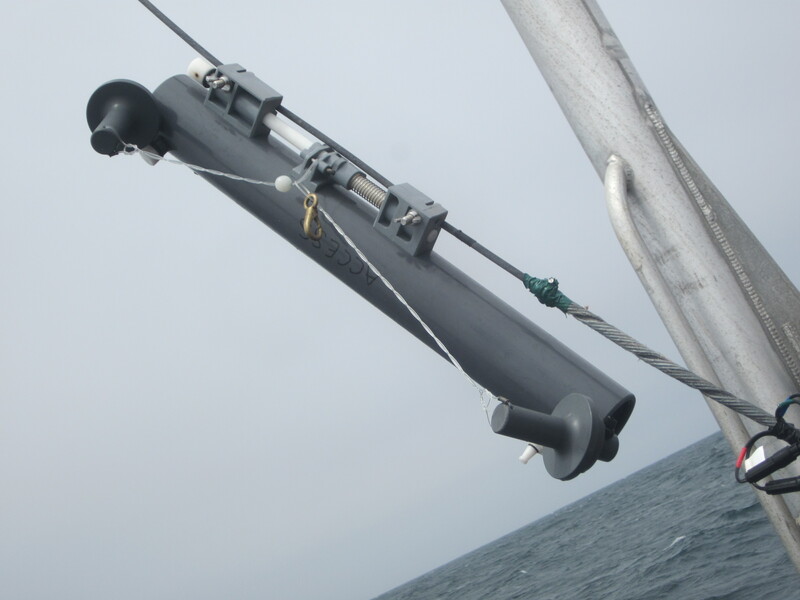 We use a CTD (Conductivity – Temperature – Depth profiler) at every place we stop. We hook it to a cable, turn it on, and lower to down until it comes within 5-10 meters of the bottom. When we pull it back up, it has a continuous and digital record of water conductivity (a proxy for salinity, since salty water conducts electricity better), temperature, dissolved oxygen, fluorescence (a proxy for chlorophyll, basically phytoplankton), all as a function of depth. We also have a Niskin bottle attached to the CTD cable. This is a sturdy plastic tube with stoppers at both ends. The tube is lowered into the water with both ends cocked open. When it is at the depth you want, you clip a “messenger” to the cable. The messenger is basically a heavy metal bead. You let go, it slides down the cable, and when it strikes a trigger on the Niskin bottle the stoppers on both ends snap shut. You can feel a slight twitch on the ship’s cable when this happens. You pull it back up and decant the seawater that was trapped at that depth into sample bottles to measure nitrate, phosphate, alkalinity, and other chemical parameters back in the lab. When we want surface water, we just use a bucket on a rope of course. 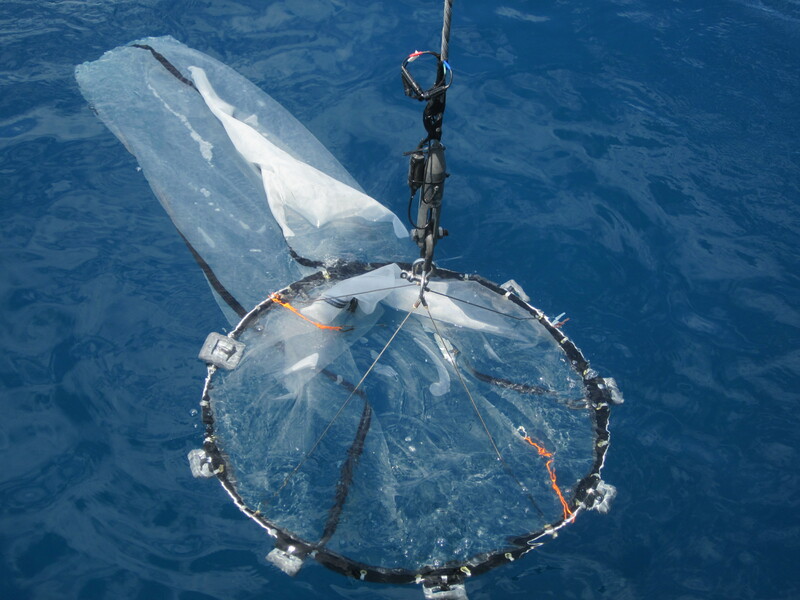 We use a hoop net to collect krill and other zooplankton. We tow it behind the boat at a depth of about 50 meters, haul it back in, and wash the contents into a sieve, then put them in sample bottles with a little preservative for later study. 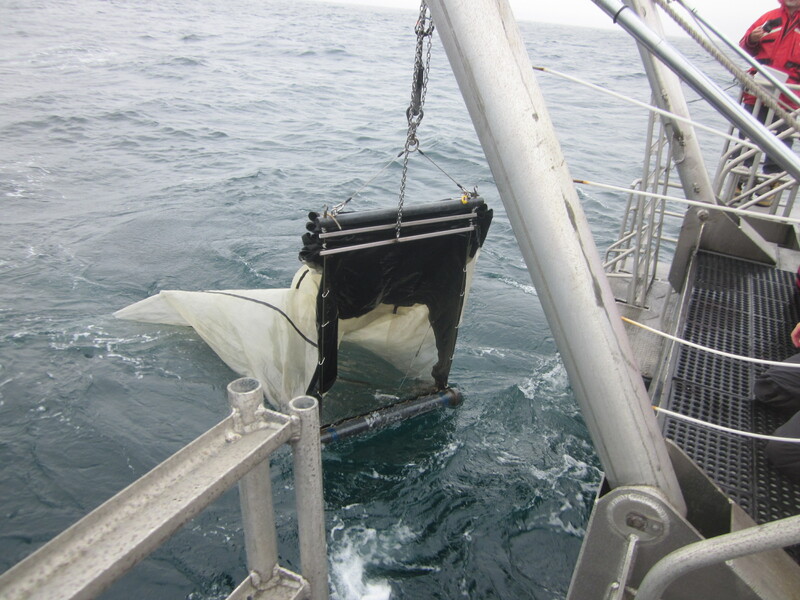 We also have a couple of smaller plankton nets for special projects, like the University of California at Davis graduate student Kate Davis’s project on ocean acidification, and the plankton samples we send to the California Department of Health. They are checking for red tides. We use a Tucker Trawl once a day on even numbered lines. This is a heavy and complicated rig that has three plankton nets, each towed at a different depth. It takes about an hour to deploy and retrieve this one; that’s why we don’t use it each time we stop. 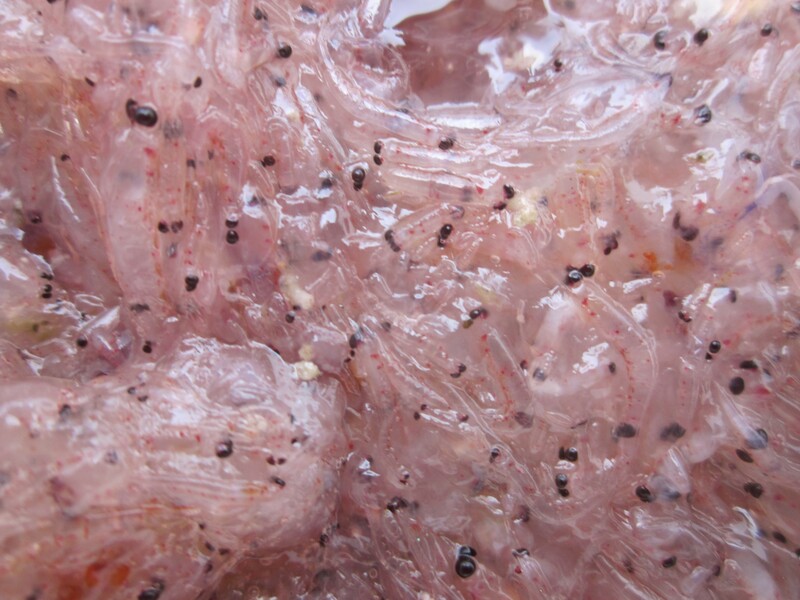 The Tucker trawl is to catch krill; which are like very small shrimp. During the day they are down deep; they come up at night. A mass of krill we collected. The black dots are their eyes. What happens to these samples? The plankton from the hoop net gets sent to a lab where a subsample is taken and each species in the subsample is counted very precisely. 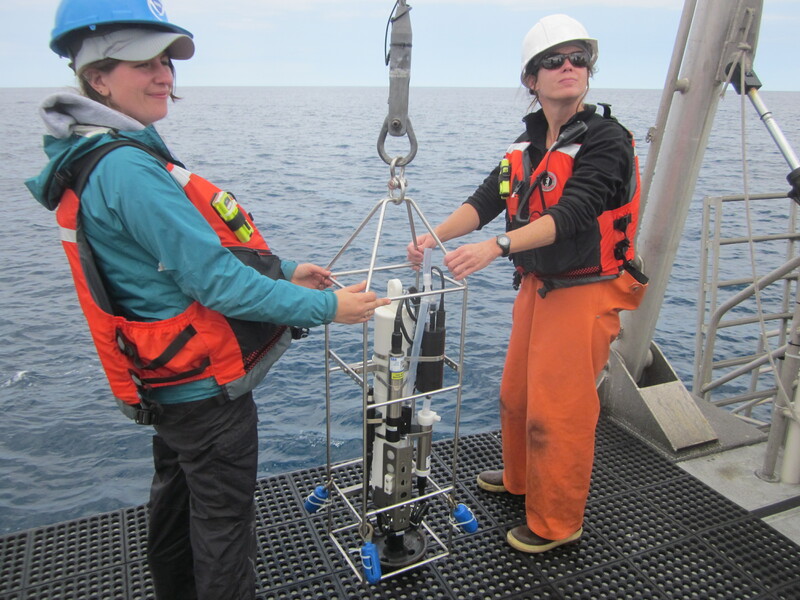 The CTD casts are shared by all the groups here – NOAA, Point Blue Conservation Science, the University of California at Davis, San Francisco State University. The state health department gets its sample. San Francisco State student Ryan Hartnett has some water samples he will analyze for nitrate, phosphate and silicate. All the data, including the bird and mammal sightings, goes into a big database that’s been kept since 2004. That’s how we know what’s going on in the California Current. When things change, we’ll recognize the changes. They told me “wear waterproof pants and rubber boots on the back deck, you’ll get wet.” I thought, how wet could it be? Now I understand. It’s not that some water drips on you when you lift a net up over the stern of the boat – although it does. It’s not that waves splash you, although that happens too. It’s that you use a salt water hose to help wash all of the plankton from the net into a sieve, and then into a container, and to fill wash bottles and to wash off the net, sieve, basins, funnel, etc. before you arrive at the next station and do it all again. It takes time, because you have to wash ALL of the plankton from the end of the net into the bottle, not just some of it. You spend a lot of time hosing things down. It’s like working at a car wash except with salty water and the deck is pitching like a continuous earthquake. 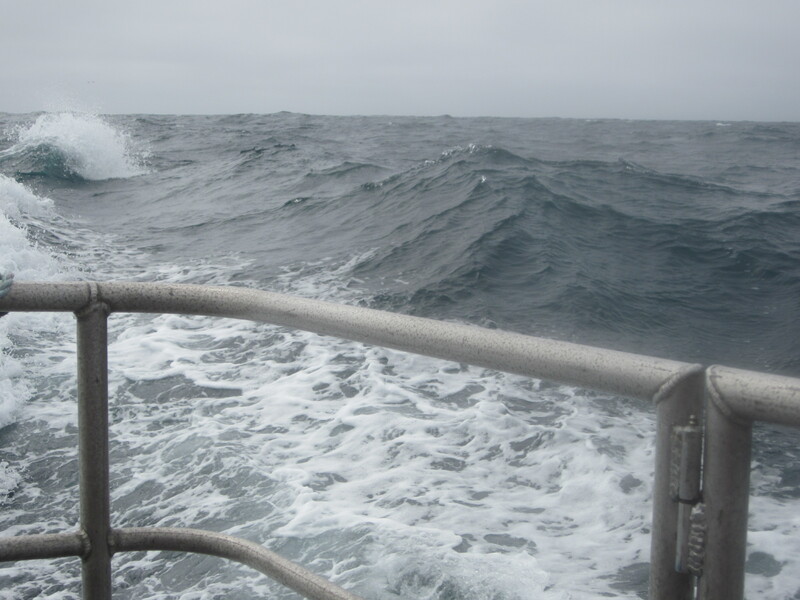 The weather has gone back to “normal”, which today means 15 knot winds gusting to 20 knots, wind waves 3-5’ and a northwest swell 3-4’ only four seconds apart. Do the math, and you’ll see that occasionally a wind wave adds to a swell and you get slapped by something eight feet high. We were going to go to Bodega Bay today; we had to return to Sausalito instead because it’s downwind. The sea state today. Some waves were pretty big. We saw a lot of humpback whales breaching again and again, and slapping the water with their tails. No, we don’t know why they do it although it just looks like fun. No, I didn’t get pictures. They do it too fast. Did You Know? No biologist or birder uses the word “seagull.” They are “gulls”, and there are a lot of different species such as Western gulls, California gulls, Sabine’s gulls and others. Yes, it is possible to tell them apart. 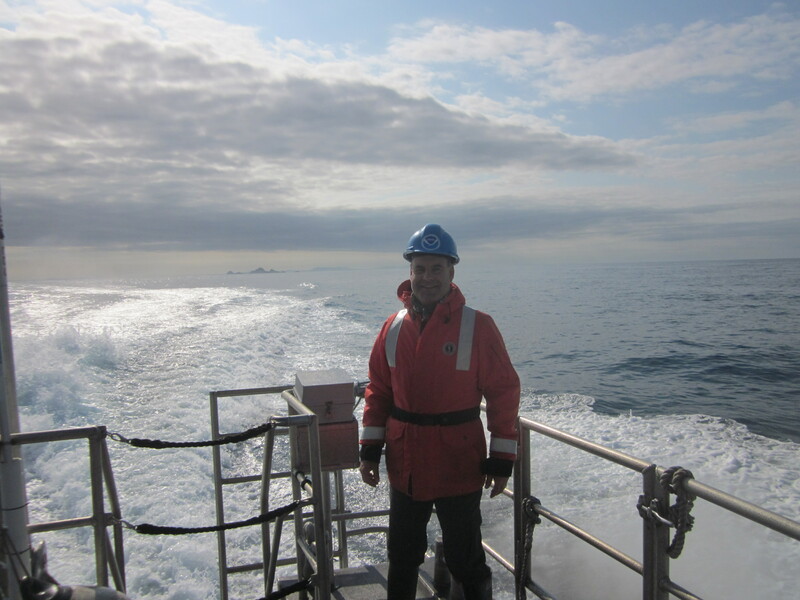 This entry was posted in 2015, Michael Wing, National Marine Sanctuary, NOAA Ocean Service, NOAA Teacher at Sea and tagged CTD, krill, plankton, sample sorting, whales, zooplankton. Bookmark the permalink. hey Doc, how’ya doing? Do you think that you could ever be a fisherman do this kind of thing every day? So what’s the data saying? What’s going on with sea temperature? How do the mammal, bird, and krll populations compare with prior years? what’s the current ocean temperature? Is it back to normal? I have read your posts, and it sounds like a really cool trip! I went to a talk in Berkley a few weeks ago, and a man, Captain Charles Moore, spoke about his different expeditions on his boat to sample plastic in the oceans. I was wondering how much plastic you have picked up in the nets and sampling devices, if any? Have you seen any impact out where you are with marine life being affected by plastic or other trash? Hello Doc what’s it like to be hit by an eight foot swel?l that sounds pretty crazy! Also how many Whales did u see? I’ve always wanted to see them. Hey Doc, what’s it like being hit by an eight foot swell, that sounds pretty crazy! Also how many humpback did you see? I’ve always wanted to see humpbacks but I’ve never had the chance to. I hope your having a great trip!